When you boil it all down, the first and primary task of software development is problem analysis. Although many people commonly view software development as the process of defining requirements and specifications, writing code and testing it, if the problem to be solved has not been correctly defined, the wrong solution will be delivered. Perhaps this helps to explain the high rate of software project failures. I was thinking about comparisons of the software industry to the building industry and the question came to mind, "How many times do you see the wrong building built?" At first, I thought "Never. Builders build what they are told to build." Then I thought about a building I drive past about once a week. It’s been finished for over a year, a nice looking industrial-type building in an industrial part of the city, but still for sale and standing vacant. I have verbalized on more than one occasion, "Why would anyone build such a large building without someone to buy it?" It appears that someone thought there was a problem that needed to be solved by building another building. However, the market seems to be indicating that the problem or need didn’t really exist. So I guess that is an example that software developers are not alone in building systems that meet a need that doesn’t exist. I think it’s important to understand that needs and problems are transitory. Today’s problem may not be so next week! Therefore, we must consider taking the longer view when we think about what really is the problem at hand. Problems are also opportunities in disguise. Just consider that most innovations were born out of the necessity of solving a problem. These are often not performed in sequential order, but rather in cycles where things are learned in the process of performing the steps. However, the problem analysis step is where much of the learning needs to occur and learning more about the problem later often results in painful changes and project problems. To embark upon requirements definition too early is human nature, but it also causes problems later in the project that are difficult and costly to resolve. We software people are often guilty of "just trying to get the job done" at the expense of first understanding what the job is. Problem analysis is the process of understanding and defining the problem to be solved. Problem analysis is not problem solving! Problem solving identifies solutions that conform to the needs and constrains of the problem. It is common to propose a solution too early that does not consider the restrictions and possible shortcuts associated with the problem. When these things are overlooked, we either have an incomplete or excessive solution. Much of what is done in designing and building information systems is to solve problems, even though the objective of the system may be seen as improving existing systems or taking advantage of market opportunities. The basic motivation of people to buy or build something is to meet a need. Needs arise most often from problems. Therefore, a big part of defining requirements is to understand the problem so that the right solution can be delivered. The following process is very helpful in defining, understanding and solving problems. We will go through each of the following steps in detail in the rest of this module. This is the first and foremost concern. If we can’t state the problem, we can’t even know where to begin in solving it. This can be one of the most difficult parts of any project and the most important. An amusing, yet sad, example of this was when a group of diplomats spent three days at the outset of an international summit debating over the size and shape of the meeting table. Likewise, when we can’t get a clear view of the problem, we can get easily distracted by all sorts of side issues. Stating the problem in writing firmly documents it for a common and firm understanding among a group of people. When defining a problem in writing, standardized processes help greatly to achieve consistency and completeness. In viewing a particular problem, people will have differing views of the problem depending on the individual person’s background and perspective. If you miss a perspective, you may miss an important angle of understanding an important aspect of the problem. In some cases, the problem that is most obvious is only the tip of the iceberg. The deeper problems may be the contributing causes to the effect that the main problem is manifesting. This goes back to the problem that should have been stated in writing from the previous step. This question verifies that the primary problem can be described accurately and completely. The contributing factors are things below the surface that have a role in the problem. The impact of the contributing factors will vary by item, but once the factors are identified, a greater understanding of the problem is gained. This identifies the people who may be available to provide additional insight to the problem. 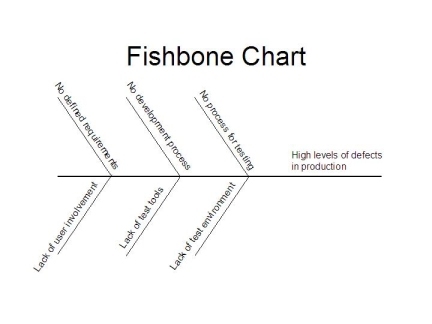 A tried and true way to describe root causes is to use what is known as a "fishbone chart." Each contributing factor is shown as a branch off of the main problem. Fishbone charts are easy to draw and work well as ways to drive a brainstorming session. This is the person that initiates and pays for the solution. This is the person that is served by the solution. This is the person that has to apply or use the solution. This is the group that controls the solution. Internal, which focuses on the problem to the solved from our perspective as the product or service provider. Each of these perspectives will have unique considerations and needs to be seen in the solution of the problem. There is only so much you have control over to affect a solution. These boundaries will form the scope of the solution. To solve the problem, to have to work within this scope and perhaps get cooperation from people outside of this scope to address the issues that are out of your control. You define the scope of the problem by considering the affected areas and specifying which things you can reasonably and effectively address. In this step, the problem can be prioritized based on severity and potential impact. Potential impact underscore the fact that a problem may not be seen as urgent or important today, yet may have the risk of manifesting as a major problem in the future. Wisdom is required at this point to distinguish between borrowing trouble needlessly and planning wisely. Does it affect the safety and well-being of people? Will the company lose money because of it? Will we be breaking the law because of it? Will the organization be at risk of legal action because of it? Will we lose an important window of opportunity because of it? Will solving this problem make a positive difference in the long-term? Is the problem adversely affecting the welfare and attitude of the organization? If any of the answers to the above questions are "yes", then you likely have an important problem to solve and should devote immediate attention to it? Is there a dictate from senior management to address this by a particular date? Are people unsure why a particular target completion date was set? Is this a concern to just a few people, even one? Have we dealt with a similar problem recently without a satisfactory solution? Is management unwilling to enact a permanent solution? Are members of management in conflict over the problem and/or the solution? If any of the answers to the above questions are "yes", then you likely have an urgent problem which may be overshadowing other more important issues. To attempt a solution may please management, but will likely not address the core issues. You will likely have the same problem again in a slightly different form atsome point in the near future. In fact, these is a strong likelihood that if you ignore this problem it will either go away or mutate into another one with the same false sense of urgency. Environmental problems, which inhibit a solution due to the nature of the business, technical environment, geographic environment, etc. Once the solution constraints are known, they can be addressed. It is common to see only a partial relief of constraints. In fact, sometimes no matter what you do, the constraints are out of your hands and you just have to figure out a way to work around them. As I have been known to tell my test teams, "When the going gets tough, the lazy get creative." This brief article only scratches the surface in what it takes to understand the problem to be solved. There have been many books written on the topic, but experience is often the best teacher. If you don’t already have a mentor, find someone who has some gray hair and is good at solving problems and watch them in action as they work to identify the real problem and set priorities. Be warned, however, these people are in a very small minority. Based on what I’ve seen in many companies, I would look outside of the IT organization and perhaps, even outside of a corporation. I know that in some ways this article may be frustrating to those who are looking for ways to solve problems right away, but I hope this article has given you a new or greater appreciation of analysis before solution. I would like to hear about your experiences and ideas in problem analysis. Feel free to write me at from the contact page. 1. Is there a standard for problem definition in your organization? 2. Has the problem been described in writing? 3. Has the problem been reviewed by people who are knowledgeable about it? 4. Has a root cause analysis been performed? 5. If so, were the appropriate people involved in the analysis? 6. Has a standard set of context-free questions been developed for your organization? 7. Have context-free questions been asked about this particular problem? 8. Have all the appropriate people been queried? 9. Have the context -free questions been answered to your satisfaction? 10. Have false assumptions been identified? 11. Has the scope of the problem been determined? 12. Have the affected people been identified? 13. Has the scope of the solution been defined? 14. Have constraints to the solution been defined? 15. Have modeling techniques been used to graphically understand the process or product described?